This is my second post for today! My Pretty Pink Posh August new release blog hop post is HERE! Welcome back! All the gorgeous sneak peek you have been seeing for past couple of days from Taylored Expressions is now available for purchase. There are eight new stamp sets with fall and Halloween themed, five new coordinating dies, twenty new free standing dies with fall and Halloween themed, two embossing folders and three matched products including Halloween themed pattern paper pad and sequins. Wow! That is a lot of variety of products to choose from. If you ask me, I want them all. They are all awesome! 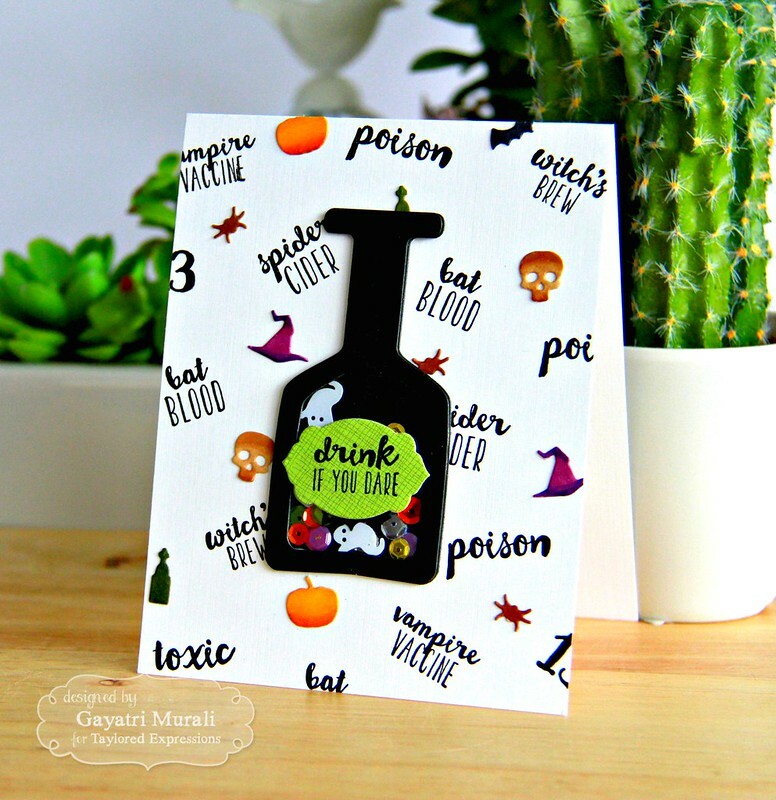 Today I am sharing a Halloween card made using Witch’s Brew stamp set, Drink if you dare die set and Halloween Confetti die. I started my card with stamping the sentiments from Witch’s Brew stamp set in black on the white card front. Then I die cut the Halloween Confetti using white cardstock and coloured the die cut using copic markers. I then glued them randomly in between the stamped sentiment on the card front. For the focal point, I die cut the Drink if You Dare die set in black cardstock. Made a shaker bottle out of it adding the Build a Scene Halloween Sequins inside. 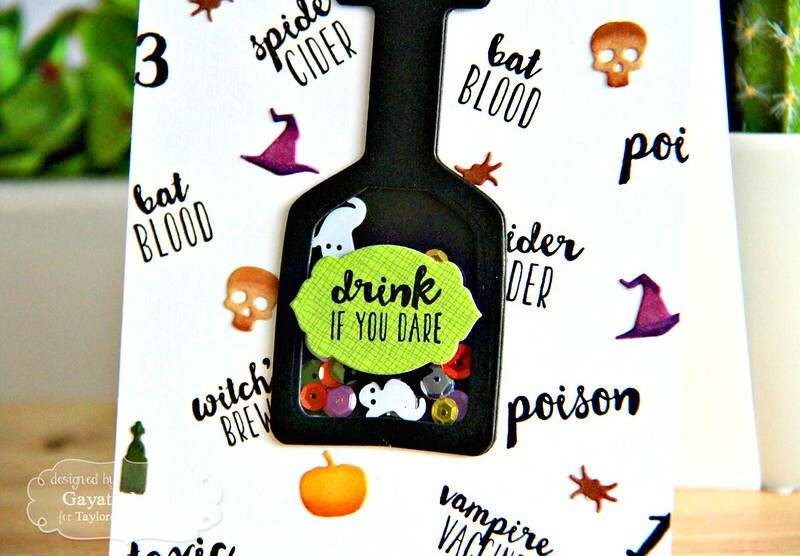 Finally I stamped one of the sentiment from Witch’s brew on to the label die cut from Drink if You Dare die set die cut using pattern paper from Build a Scene Halloween pattern paper pack. I adhered this on the front of the shaker bottle. This shaker bottle is adhered on the card front as the focal point. I will share more projects using the new release goodies from Taylored Expressions in a day or two. I have listed all the products I have used on my card below. Cute! I love that you made the bottle into a shaker. Thanks for sharing. Such a neat card I love it! Your use of color is always spectacular Gayatri! LOVE THE SHAKER …. so darn fun. That is one cool spooky card.